Isolation kits are often used in petrochemical applications electrically isolate two mating flanges to reduce the likelihood of creating a galvanic cell which would result in corrosion of the flanges and pipework. Isolation kits are also used to prevent the flow of electrostatic charge to reduce sparking in hazardous environments. Neoprene-faced phenolic resin gaskets are often used in class 150 and 300 applications and for use between -40 and 100°C and often comprise a central gasket and two reinforced phenolic, two steel washers and one Mylar sleeve per bolt. 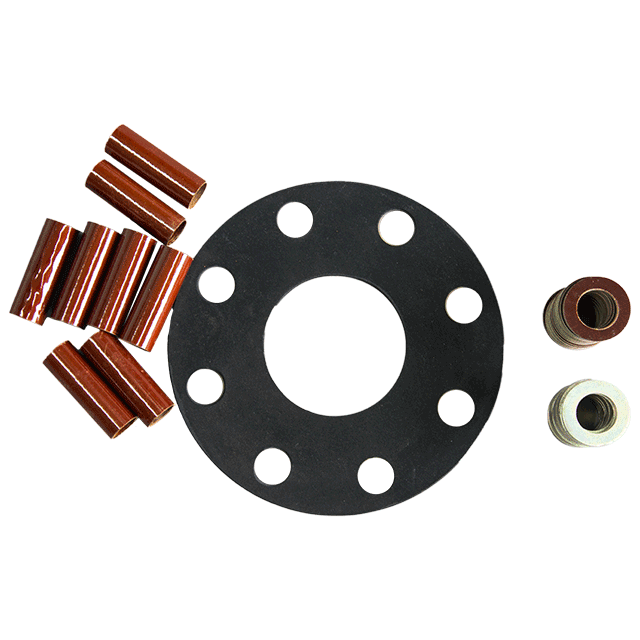 Isolating kits are often only used for low pressure applications with low installation stresses and can manufactured in two styles Type E (full face gasket) and Type F (raise face gasket). Moreover, Type D insulation gaskets use the same basic materials as the standard insulation sets but are designed for RTJ flanges. The insulating sleeves can also be supplied manufactured from phenolic resin or high-temperature Nomex fibre.